Unless you live in the Southeast, you may be unfamiliar with Publix Supermarkets. Yet some of the innovations we take for granted when shopping for groceries -- such as "electric eye" sliding doors and parking lots with angled spaces -- were developed by this grocery chain. The 85-year-old firm, based in Lakeland, Florida, is also notable for its profits. At a nearly 8 percent operating margin and 5.7 percent profit margin, Publix is more profitable than Walmart (WMT), Kroger (KR) and even tiny natural grocer Sprouts Farmers Market (SFM). The company's annual profit margin also exceeds that of Whole Foods Market (WFM) by roughly 1.5 percentage points, even though, at $27 billion in annual revenue, it's nearly twice Whole Foods' size. Publix is a quiet force in American retail. It's No. 104 on the Fortune 500 list, it falls between Dow Jones Industrial components McDonald's (MCD) (No. 106) and 3M Corp (MMM) (No. 101). Unfortunately, however, you and I can't buy Publix stock on the open markets. The company is employee-owned through its Employee Stock Ownership Plan. According to the National Center for Employee Ownership, Publix is by far the country's largest majority employee-owned company. After launching its first location in 1930 in Winter Haven, Florida, Publix has expanded methodically ever since. 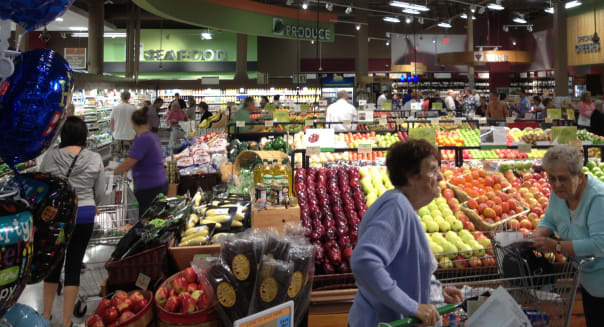 It's the dominant grocer in Florida, with 760 locations statewide. The organization totals nearly 1,100 stores, with the remaining locations split among Georgia, South Carolina, Alabama, Tennessee and North Carolina (the company's newest market). Publix stores strive for off-the-charts customer service as a primary means to lure customers back again and again. In fact, company management cites its labor-intensive focus on greater customer service versus competitors as a possible business risk as well as an advantage, due to the uncertainty in the labor market, which could lead to increased costs. Yet company employees have a vested interest in keeping shoppers returning, while performing with maximum productivity. In addition to quarterly and annual bonuses, employees receive an annual equity share bonus the company calls "free stock" in their retirement accounts. Wage earners also get perks not typically found in larger companies, such as weekly, rather than monthly, paycheck deposits. Culture and employee engagement are often cited as reasons Publix is more profitable than peers of every size and stripe. To be fair, the employee base, while a clear driver of results, isn't the only reason behind Publix's success. Continuous operation since its Great Depression-era founding has provided Publix plenty of time and toughness to hone its approach in the cutthroat grocery business. And because the company's sales are still heavily concentrated in Florida, it gets a seasonal boost from the influx of nonresidents who flock south each winter, swelling the company's grocery aisles with snowbirds and tourists. Being private means that Publix can be a maverick when it chooses. For example, for years, the company has taken some of its excess cash each quarter and purchased short- and long-term investments. Publix now has a monster hoard of $6.4 billion invested in debt and equity securities. To put that into context, Publix holds more in cash and investments on its balance sheet ($6.8 billion) than does Walmart ($6.7 billion), which is 16 times its size by revenue. A public grocer would likely come under fire from activist shareholders for keeping such a large investment balance on its books and be forced to liquidate some holdings to buy back shares or increase its dividend to shareholders. Without this pressure, Publix realizes handsome income each quarter from its stock and bond holdings: In the last quarter, investment income of $96.4 million was the equivalent of a remarkable 5.4 percent of total operating profit. Publix stock may only be available to employees, yet the company's stellar financial performance provides a benchmark that public competitors can be measured against. Grocery chain investors can visit the Publix stockholder information page for yardsticks in the form of the company's quarterly and annual financial statements. One comparable company leaps to mind that, like Publix, places a great deal of emphasis on culture. For a publicly traded corporation, Whole Foods Market's well-regarded benefits, bonus plans and stock grants have a cooperative feel. For example, 95 percent of Whole Foods employees receiving stock grant options are non-executives. Rumors flared in June 2014 that Publix had some interest in acquiring Whole Foods. While the company didn't comment on the rumor, and a merger would seem implausible, the two do share many similarities regarding employee philosophy and financial performance. In fact, if you own Whole Foods, Publix may be the single most important competitor for you to follow. Whole Foods shareholders often wonder if the natural-foods grocer can maintain its current profit margin of 4 percent, manage a same-store sales growth rate above 5 percent and still maintain its core values, as it seeks to nearly triple its store count over the long term to 1,200. Well, there's a massive if publicity-shy grocer in the Southeast that will soon hit 1,200 stores, and regularly nails very similar financial targets,while rewarding its employees quite handsomely in the process.